The MYDO Baitswimmer # 4 is available on it’s own ready for you to custom rig your traces. This 3.5 Oz Baitswimmer can handle a bait from a pinkie to a 2kg bonito and gets you working the bottom echelons of the water column effectively. Without the need for downriggers or dropaway weight rigs. MYDO Bait swimmers make it so easy to swim a perfect couta bait – perfectly straight, and at the right depth. The heads hydrodynamic foil design features, impart a side to side swimming motion to the bait, bring it “back to life!”. Weighing in at a bottom fetching 99 grams, this MYDO can handle any bait up to 30cm or more. It is also perfect for walla walla and silkies – bend the pin into a round shape to handle the long bottom jaws of these fantastic baits, and get them down there to where the big fish hunt. 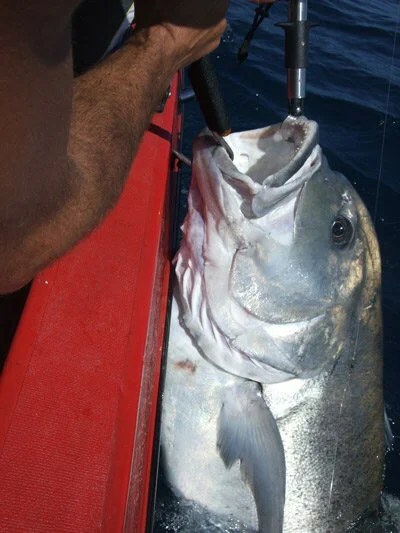 Estimated 60kg GT released in southern Mozambique taken on a MYDO Live-Baitswimmer trace # 2 rigged heavy. MYDO Baitswimmer heads can also be fished as downriggers…great for trolling daisy chains for snoek…your line never twists up! This lure has gathered more followers than Facebook as it has for decades assisted many an angler in making his best catches. And it might well be the most successful deep-sea fishing competition rig ever made. Brian Davey on the classic old Acecraft “”MYDO””, won a string of boats in the eighties. Then with Glynn Williams’ continued the winning streak by taking the Pennington Couta Classic on Ace of Harts back in 1989, using the Mydo # 4. A string of boats went home to new owners courtesy of The Mydo. The latest boat to be won by a Mydo rig, was the Defillipi family down at Port Edward in 2015, taking the honours with a 22kg couta photographed and released, in the dying minutes of the comp. MYDO Baitswimmer # 4 with a mackerel, exactly as pictured above. The MYDO Baitswimmer #4 takes another boat! This one at the 2014 Port Edward Marlin Ski-Boat Club catch n release tournament. 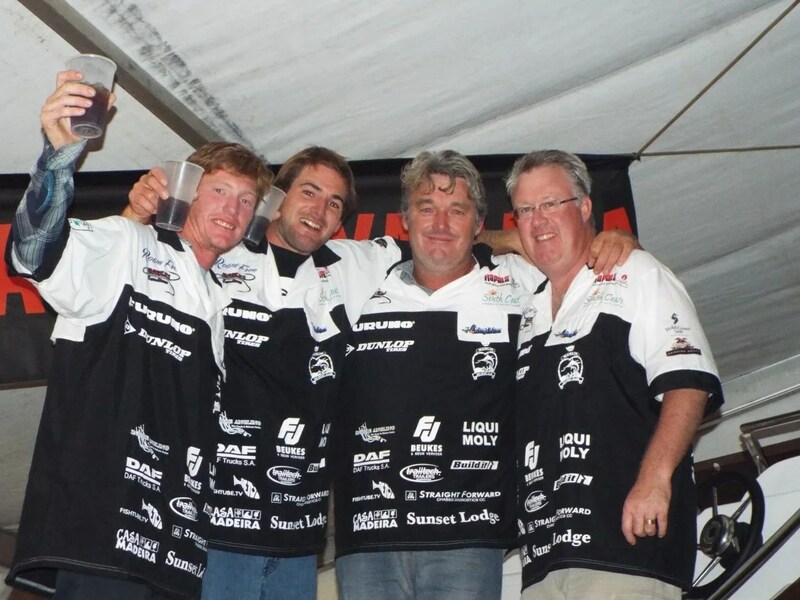 Dave Defillipi, Moo Fraser, Greg Defillipi and Commodore of the Marlin Ski-boat Club. Rigged with single hooks, and powerful wire, in this IGFA compliant presentation, you can break the spirit of any mean-spirited fish. They have been tested to hold out at 60kg’s of drag or more, so you can keep those Amberjack and Yellowtail from taking you into the bricks. The Mydo Baitswimmer # 4 is not light. It needs to be rigged heavy. Down deep where the monsters roam, there is less light and visibility, so rigging up a few notches is acceptable. Especially since generally speaking, the deeper you fish, the bigger the fish get! At least # 7 on the leader. And twisted pair #7, or #8 or #9 on the droppers. To 5X trebles, or heavy-duty singles. In Mozambique when fishing the back ledges of the shelf, tackle up even more. Chances of bumping into a small marlin or huge GT, means you need the pulling power. Singles work better during the fight, but trebles hook up better. Huge trebles, like 5/0 5X don’t let go of anything really, so that is our recommendation, for when fishing our deep ledges, along the continental shelf. Andre Viviers keeping it up with this lekka yellowtail taken whilst fishing with his brother Koos, and my brother, Marc Lange. All Team Mydo. More about Mydo Baitswimmers here. For further information or questions, pop us an email at umzimkulu@gmail.com, or call +27 79 326 9671.